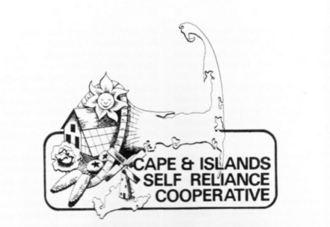 During the winter of 1979, along with three other local service agencies, New Alchemy was contacted by the Community Action Committee (CAC) of Cape Cod and asked to take part in planning and implementing a regional food and energy assistance agency for Cape Cod - the Cape and Islands Self Reliance Cooperative. 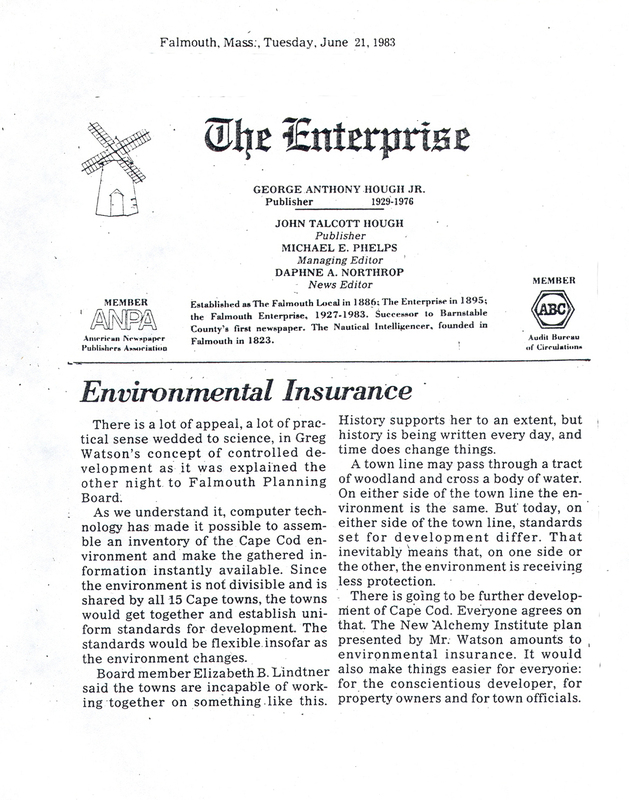 The goal of the cooperative was to combine the technological expertise and the innovations of New Alchemy, the community organizing experience of the Cape CAC, the housing and energy financing counseling of the Housing Assistance Corporation (HAC), the energy auditing and weatherization skills of the Energy Resource Group (ERG) of Martha's Vineyard and the fishing, farming and aquaculture expertise of the Wampanoag Tribal Councils of Mashpee and Gayhead. 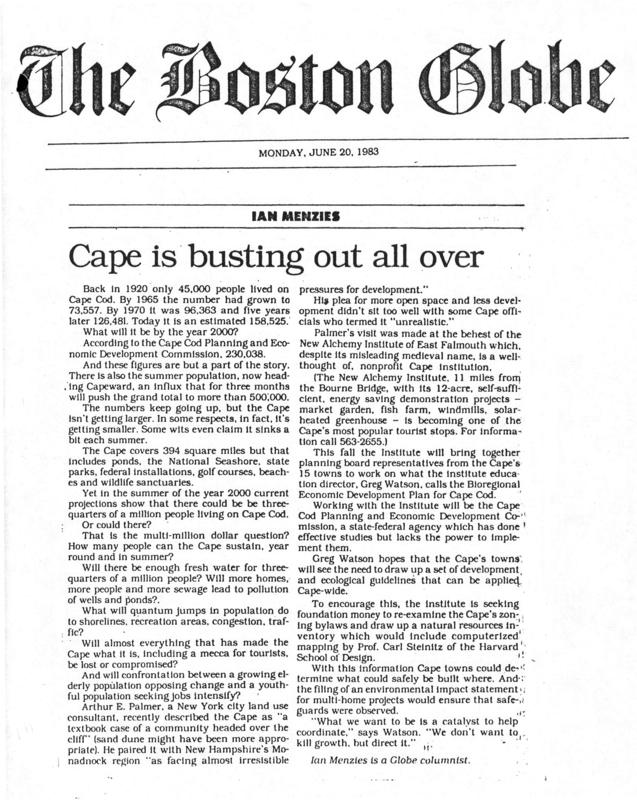 We would create a vehicle via which residents of the Cape & Islands could adopt ways of achieving some measure of food and energy self reliance. 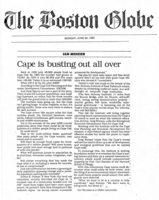 The Cape Cod Biorgeion Plan was an attempt to get the towns of Cape Cod to work together to develop a comprehensive sustainable development plan for the entire peninsula. 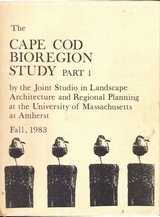 We wanted to demonstrate that the concept of a bioregion (the ecological characteristics of a place) were more important than political boundaries in understanding and exercising the options most likely to serve the best interests of the residents inhabiting Cape Cod. 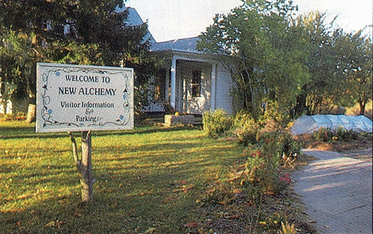 The New Alchemy Institute was born during the 1969-70 academic year. 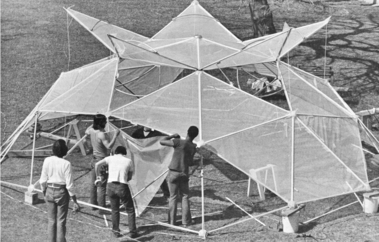 It organized partially in a series of evening seminars held by John Todd and Bill McLarney for their biology students at San Diego State College. 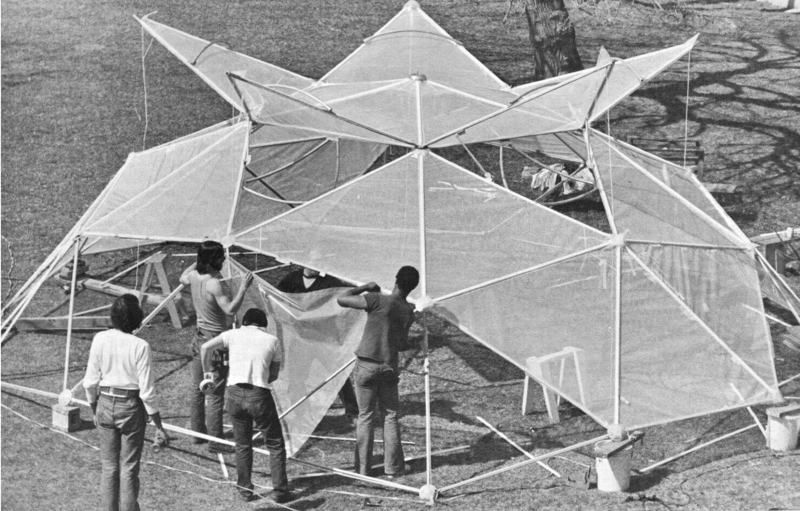 Because the seminars were concerned with environmental deterioration and damage to biological systems, they were well attended by students, staff and often other interested people...A question that arose repeatedly in those late hours, before people drifted off, was: Could anything be done? I spent four years in total at the New Alchemy Institute. 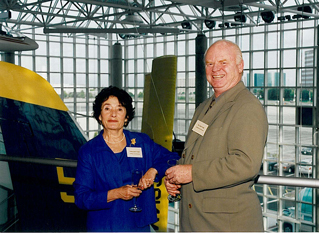 From 1980-1983 as the institute's education director and as its executive director in 1989-1990. 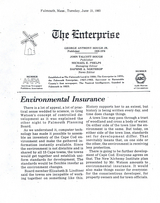 It provided me with a new ways of addressing a huge question I was wrestling with: namely, is it possible to work simultaneously to achieve both economic equality and environmental quality? I also wanted to find out if Nature's design strategy could be applied to help address the challenges confronting urban environments. New Alchemists practiced a reverent form of biotechnology that has evolved into the discipline called biomimicry. 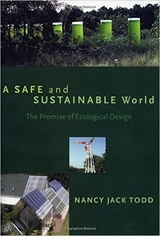 Our goal was to study Nature's grand design strategy and apply her principles for "doing more with less" to the challenge of creating human life support systems that were economically viable and environmentally sound. New Alchemy's Bioshelters combined passive solar architecture, agriculture and aquaculture systems to create an integrated sustainable food producing "living machine". 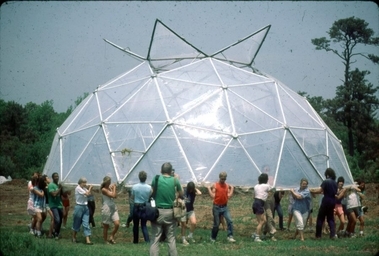 The glazing or "skin" of the structure (The dome above, Ark below) allows energy as sunlight to penetrate. The plants use the light to photosynthesize. Much of the light is converted into heat energy. The glazing that allowed the energy sunlight to pass through readily blocks the energy as heat (different wavelength). 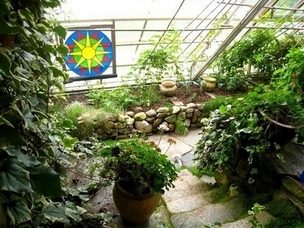 This is the greenhouse effect that is, in fact, critical to maintaining the conditions necessary for life. The New Alchemists sought to develop environmentally sound approaches to meeting our basic needs of food, energy and shelter. 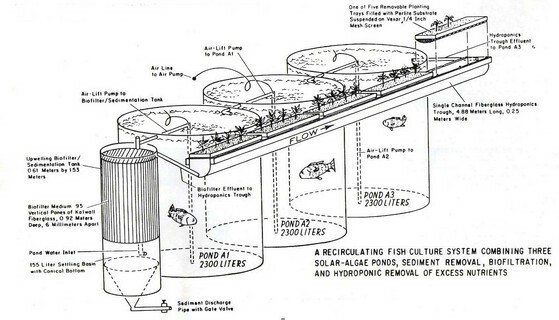 Tall cylindrical tanks called solar algae ponds are used to raise fish (talapia). Water containing fish waste is used to irrigate the agricultural crops in the bioshelter. One of the primary lessons gleaned from Nature is that the byproducts of one system are used by one or more other systems as inputs. 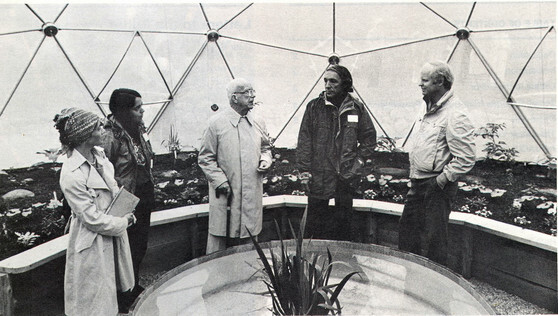 Bucky Fuller (center) inside the New Alchemy Pillow Dome in 1982 with (l-r) Nancy Todd, Liz Fial, Jay Baldwin and John Todd.